42nd President of the United States. Picture of Arkansas Governor Bill Clinton taken at a rally in front of the Executive Mansion the day after the Presidential debate in Richmond, Virginia on October 16, 1992. William Jefferson Clinton is the first Democrat to win a second presidential election since Franklin D. Roosevelt in the lowest turnout of eligible voters since 1924. 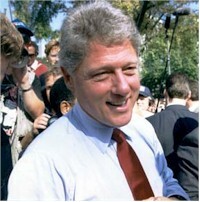 President Clinton received 379 electoral votes and slightly less than 50% of the popular vote. In Virginia (CBS News, Campaign 96, State by State, November 6, 1996): PRESIDENT (13 Electoral Votes/99% Precincts Reporting): Bill Clinton (D) 1,070,990/45%; Bob Dole (R) 1,119,974/47%. In Charlottesville '96 ( Unofficial results, Daily Progress, November 6, 1996): PRESIDENT: Bill Clinton (D) 7,916; Bob Dole (R) 4,091.